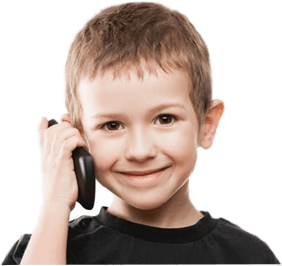 Operation Round-Up is one of the contributions to society of which the Coweta-Fayette EMC is most proud, and it could not have been successful without the willingness of you, our member/owners, to participate. There have been many recipients over the years, shown here are just a few of the recent neighbors who have benefited from your generosity! 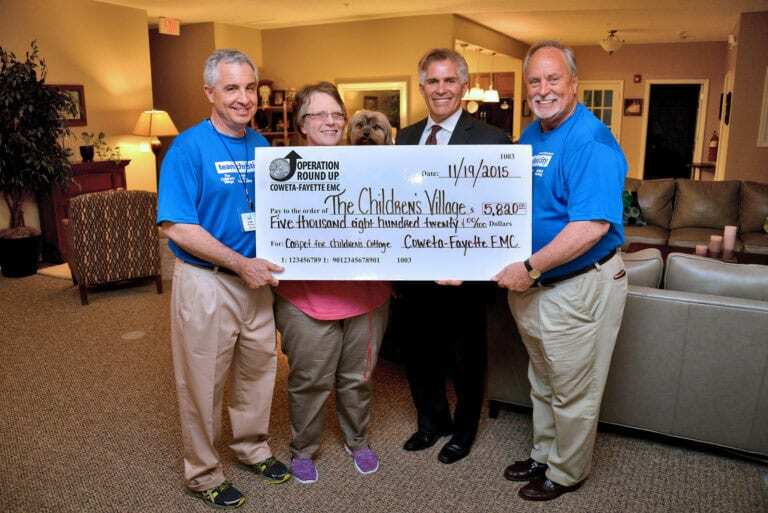 A grant from Coweta Fayette EMC Operation Round Up paid for the replacement of carpeting at The Children’s Village at Christian City. From left, Len Romano, Christian City CEO; Kay Harkness, Lead House Parent at The Children’s Village; Coweta-Fayette EMC Trust Board Chair, Glenn Valencia; and Philip Kouns, The Children’s Village COO. Pictured in the center is Kay’s precious and faithful pet dog, Jake. 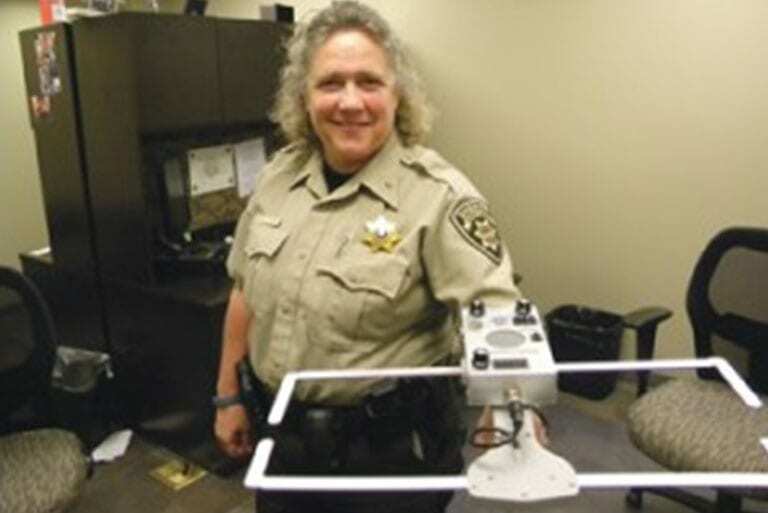 The Coweta County Sheriff’s Department was awarded funding for Project Life Saver. A tracking system that will help locate persons with Alzheimer’s that have wondered away from home. 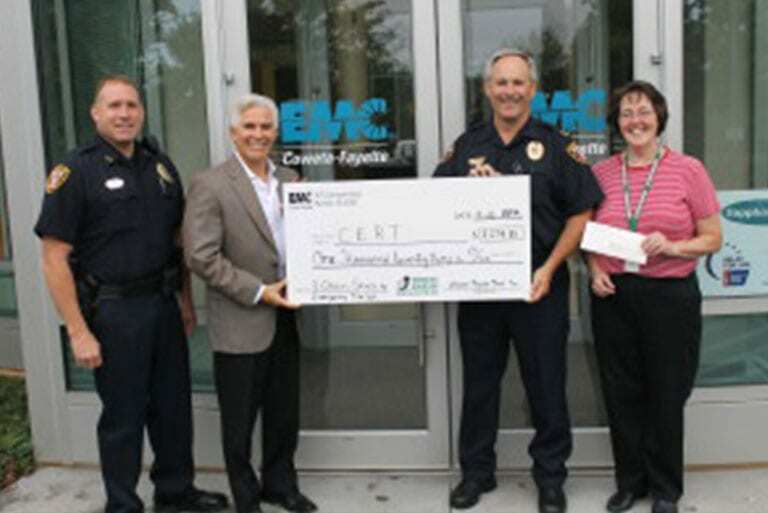 The Community Emergency Response Team (CERT) in Peachtree City received a donation to purchase additional equipment needed to help local families during catastrophic events. 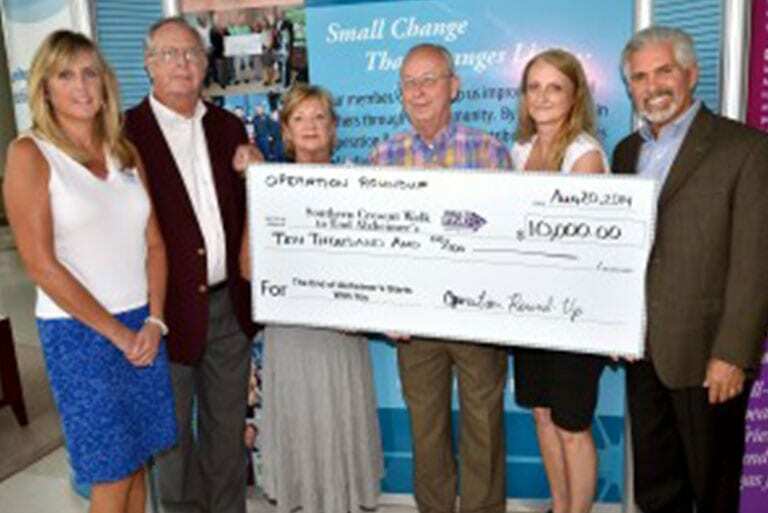 A donation was presented to the Southern Crescent Walk in Fayette County to help towards ending Alzheimer’s. 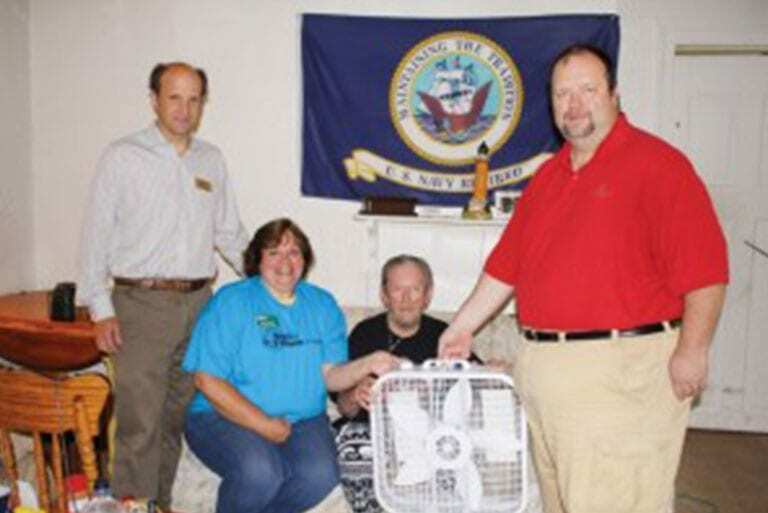 Thanks to Coweta County 911 and Operation Round Up, 200 fans were purchased and delivered to elderly residents living without air conditioning. 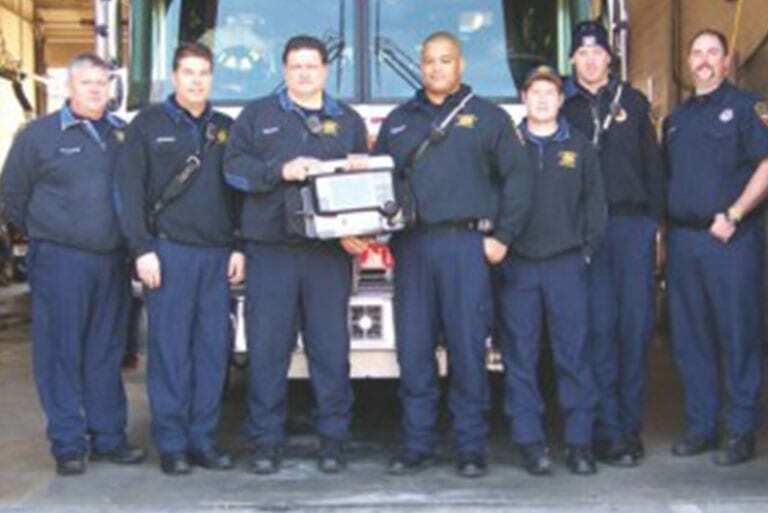 Funds were awarded to the Fayetteville Fire Department to help purchase Life Pak Automated External Defibrillators and accessories for helping save lives in Fayette County. 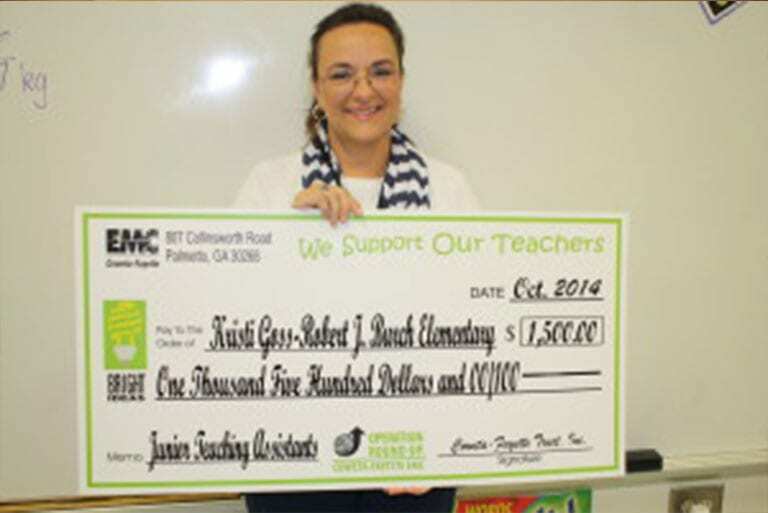 Kristi Goss at Robert J. Burch Elementary in Tyrone received a grant from the Bright Ideas campaign. Bright Ideas is a grant program sponsored by Coweta-Fayette Trust, Inc. and Coweta-Fayette EMC that awards funds to teachers to put innovative and creative education projects into action.